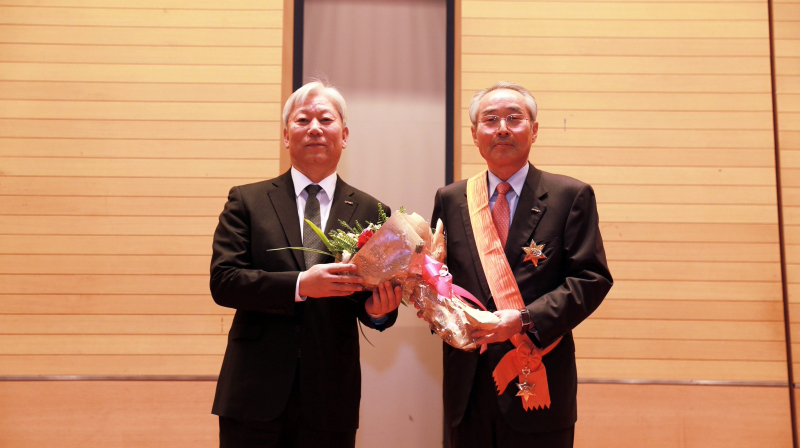 In recognition for his hard work and dedication to UNIST, President Mooyoung Jung (left) delievered the 1st class of the Order of Service Merit to Dr. Moo Je Cho (right) on April 4th, 2016. UNIST to host a special keynote lecture by its founding president, Dr. Moo Je Cho. In the afternoon of April 4th, UNIST invited Dr. Moo Je Cho, former president of UNIST to give a keynote lecture, entitled “Future Education for Fourth Industrial Revolution” in the auditorium at UNIST KyungDong Hall. Dr. Cho dedicated nearly half his life to education. This lecture aims to help students to determine future career and to find their dreams and vision. In his speech, Dr. Cho emphasized how higher education institutes would be affected by the Fourth Industrial Revolution and their new role to deliever future generations with the right set of skills and knowledge. UNIST also commemorated the event by awarding Dr. Cho the 1st class of the Order of Service Merit, the Blue Stripes Medal for contributing greatly to the development of education in the City of Ulsan and by implication, the country. 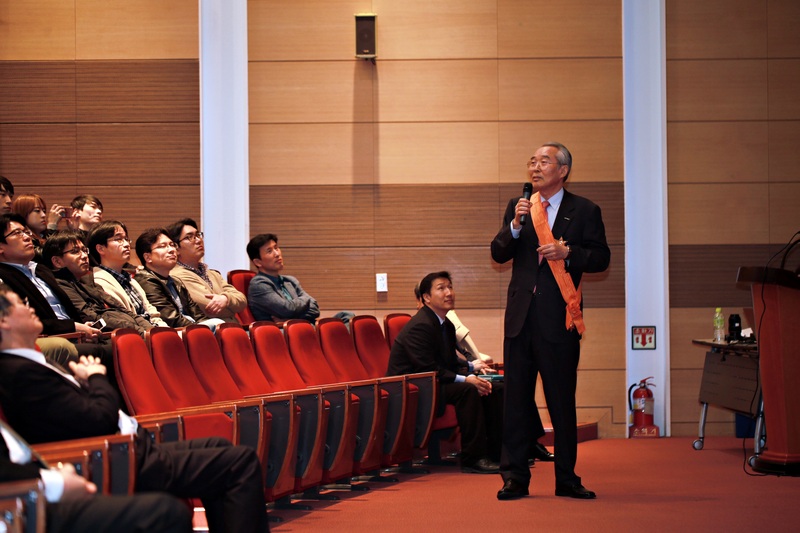 During the course of the event, Dr. Cho also received the title of emertitus professor. Dr. Moo Je Cho is the Founder and the 1st President of UNIST. He began his tenure in September 2007 when the university was little more than an idea. During his tenure, Dr. Cho has provided wise and steady leadership to UNIST. Thanks to his exceptional and sustained leadership, UNIST now stands shoulder to shoulder with world’s top universities in the Lithium-ion Secondary Battery research field, along with MIT an Stanford University. Not only that, in recent years, UNIST has been also designated as a government-funded research institute and hosted 3 IBS campus site labs, led by world-renowned scientists.